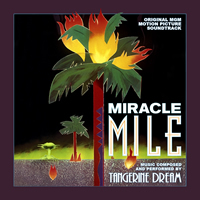 Have just ordered Miracle Mile OST on marbled coloured vinyl from CD Services in Dundee. Not cheap but it is an album I really like and will be good to add to my vinyl collection. Have it in order from CDS too. Really looking forward to it. It looks awesome. Received my copy yesterday so shall play it over the weekend. Have also ordered the cd version. WIth the solid 2-CD re-release from Dragon's Domain Records only nine months ago, it is strange that yet another re-release is coming for CD now. I still have the new LP in order from CDS though. Looking forward to it! Or Edgar Froese singing over the music.